Though now recognized as one of the towering figures of Italian Renaissance culture, Ludovico Ariosto (1474-1533) spent his working life in the service of the Este lords of Ferrara. This city, north of Bologna, is now a sleepy university town but in the early modern period was at the cross-roads of a vast European struggle to gain control of the Italian peninsula, and Ariosto’s great epic poem, Orlando furioso (Mad Orlando), registers these conflicts in multiple ways. 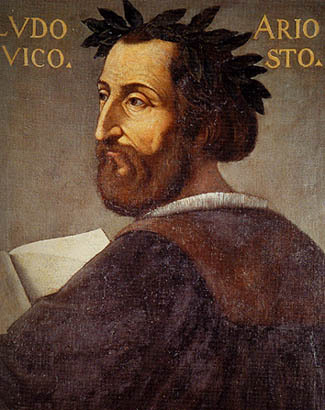 Ariosto was born into a minor aristocratic family and studied both law and classical literature, but the premature death of his father exposed the precariousness of the family’s financial situation and compelled Ludovico into the role of bread-winner for a large clan, first as a diplomat, then as the governor of Este-controlled territories in the isolated mountainous region of the Garfagnana (to the north and east of Lucca), and finally back in Ferrara as master of ceremonies and entertainments for the Este court. As with so many other major Renaissance writers, Ariosto’s extraordinary literary work was accomplished amidst other – frequently onerous – responsibilities, and Orlando furioso slowly took shape over the course of three decades. First published in 1516, Ariosto continued tinkering with his poem and brought out expanded versions of it in 1521 and 1532. In addition to the Furioso, Ariosto wrote other poetry – in both Italian and Latin – and he was among the first to write stage comedies in a European vernacular language. A series of Satires provide biting send-ups of some of the most prominent figures in Ariosto’s world (including the reigning pope, Leo X, or Giovanni de’ Medici).